Despite great untapped potential, the Spanish solar process heat market is not growing as expected. Is it perhaps because many in the industry are not targeting the right sort of customer? Valencia-based start-up Solatom seems to have devised a winning strategy, offering small and medium-sized manufacturers a simplified, standardised product. The main component, a preassembled collector, can be installed in just one hour. In the photo, a unit is seen arriving in Girona, to the north of Barcelona. Solatom was founded in June 2016 and is formed today by a team of seven solar and aeronautical engineers. They have developed a linear Fresnel collector that has 20 kW of peak thermal power and provides steam at up to 300 °C for solar-heated industrial processes, also known as SHIP. Multiple units can be combined to increase capacity. Their low specific weight of less than 23 kg/m² makes them ideally suited for roof mounting. Solatom has started up three SHIP plants so far. Another two, or three, are in the works and scheduled for commissioning by the end of the year. The company’s customers have used or are using conventional fossil fuel boilers, which are considerably more expensive to run. The distinctive feature of the new system is a preassembled solar collector, which is ready for transport as a complete unit. Solatom’s Managing Director Miguel Frasquet explained at the first-ever Concentrating Solar Heat Workshop, which was held in Amman, Jordan, in mid-September, why preassembly had been essential to his company’s SME strategy. Frasquet said that Spain’s SHIP market was progressing very slowly, even though the potential for medium-temperature use in the industry was 37 GWth, as highlighted in a study from December 2015. He added that most market players had arrived from the concentrating solar power sector. 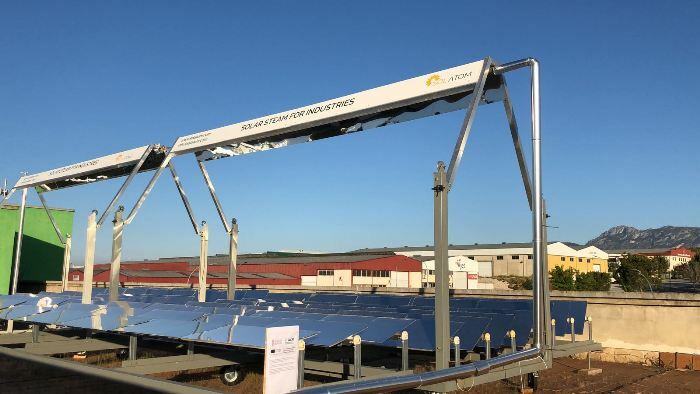 Following the end of the CSP feed-in tariff, they had started looking into solar process heat to seek out new business opportunities and appeal to very large companies in particular. Many of those big companies, however, had to pay very little for energy because of high consumption and optimised processes, so that solar plants were rarely economically viable. The PABLO algorithm (Probabilistic Algorithm for Better Lead Acquisition), developed in collaboration with the Solar Concentra technology platform. It allows for sifting through industry data at the municipal level by fuel price or type, heat demand, solar irradiation, company turnover and staff numbers (results of PABLO calculations in the who is who study). A free online calculation tool, RESSPI, to carry out a quick and low-cost feasibility study. RESSPI has been developed by an open research initiative and can be used to conduct rough simulations in less than a minute. The preassembled collector. It was designed for easy installation, so complex and expensive on-site construction could be avoided.